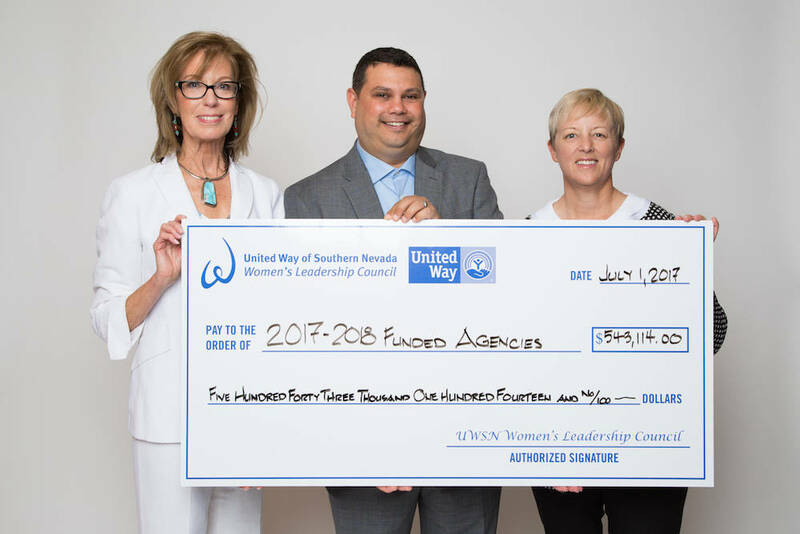 United Way of Southern Nevada’s (UWSN) Women’s Leadership Council (WLC) has announced that it invested a record-breaking $543,114 into the community to change lives and help families break the cycle of poverty. This year marks the first year of United Way’s Community-Based Agenda (CBA), its road-map to improving lives focused on helping the whole family from cradle to career. It is based on providing strong starts for children and students while supporting their families to end multi-generational poverty and create lasting, transformational change for Southern Nevada. “WLC is proud to serve as a pacesetter to move forward the dynamic cradle-to-career framework, a pipeline supporting children and families through early childhood education, high school achievement, post-secondary attainment, and workforce supports,” said WLC Co-chair Robyn Caspersen. By focusing in these four areas, WLC is laying the groundwork for impactful change and building on the positive change that has already occurred. To learn more about the Women’s Leadership Council or the funded programs, contact United Way Senior Director Major Gifts Lawrel K. Larsen at 702-892-2319 or LawrelL@uwsn.org. Shriners Hospitals for Children Open returns for its 35th consecutive year from Oct. 30-Nov. 5 at TPC Summerlin. The annual tournament supports the mission of Shriners Hospitals for Children to provide exceptional child health care nationwide. Volunteer opportunities during the tournament include standard bearers, caddie services, admissions, walking scorers and shotlink operators. Experience in golf and knowledge of the game is not required to volunteer. Individuals supporting the mission of Shriners Hospitals for Children and golf fans alike can get involved and help boost the cause that impacts the lives of children across the nation every day. New and returning volunteers will receive an invitation to the Volunteer Appreciation Party, a weeklong tournament access badge, a commemorative gift, meals during shifts and a uniform including a tournament golf shirt, jacket and hat. Volunteer registration is $75. This fee accounts for the accommodations volunteers enjoy while participating in the event. Shriners Hospitals for Children Open is operated as a 501(c)3 charity and every available dollar is dedicated to the mission of raising awareness and money for the Shriners Hospitals for Children. To register as a volunteer or learn more about the opportunity visit www.shrinershospitalsopen.com/volunteer. For any questions regarding volunteering, email Donna Millwood at dmillwood@shrinershospitalsopen.com. This summer, Bank of America selected five high school seniors from the Las Vegas community as Student Leaders. Part of the company’s three-year $40 million commitment to connect youth and young adults to skills, training and jobs, the program offers young people, who are engaged community citizens, an opportunity to build their workforce and leadership skills through a paid summer internship at Boys & Girls Club of Southern Nevada and participation in a national leadership summit in Washington, D.C.
“Through Student Leaders, Bank of America enables young people to develop workforce and leadership skills, including advancing diversity and inclusion, developing a greater understanding of the value of cross-sector partnerships, and establishing a professional network, that can lead to future career success and in turn help the economic progress of Las Vegas,” said Al Welch, Las Vegas market president, Bank of America. “For 13 years, Bank of America Student Leaders have made a positive impact on the Boys & Girls Clubs of Southern Nevada. We are excited to be part of a program that gives young adults the opportunity to develop new skills, and aligns with our mission to provide all young people, especially those who need us most, the tools and resources to be productive and caring citizens. We are thankful for Bank of America’s continued support,” said Andy Bischel, President and CEO of Boys & Girls Club of Southern Nevada.